Data analysts commonly use IF THEN ELSE statements when attempting to create a calculated field in a BI query and then filtering results on that calculated field. However, this can be difficult to do in the SQL editors, because neither Oracle nor SQL Server supports direct IF THEN ELSE statements. And Toad Data Point does not currently supply a way to use IF THEN ELSE statement when the underlying database does not support those. No worries, the magical solution is quite simple… A SQL CASE statement to simulate the IF THEN ELSE logical construct. First, let’s look at the available mathematical operators and functions available in Toad Data Point using an Oracle connection. With every good magic trick, one has to convince the skeptics. Following the numbered instruction below will prove there really is not a conditional IF statement available. Never fear the SQL CASE statement is near! 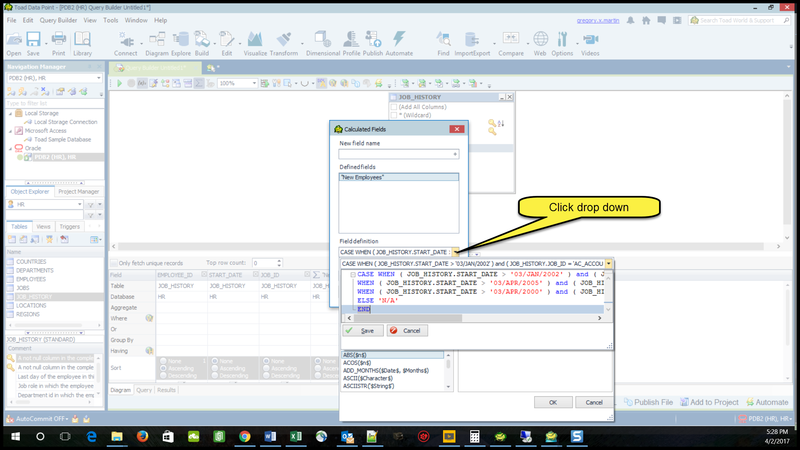 1) Drag the JOB_HISTORY table into the Query Builder and check the EMPLOYEE_ID, START_DATE and JOB_ID fields. 2) Order by the EMPLOYEE_ID to maintain consistency in the result set. 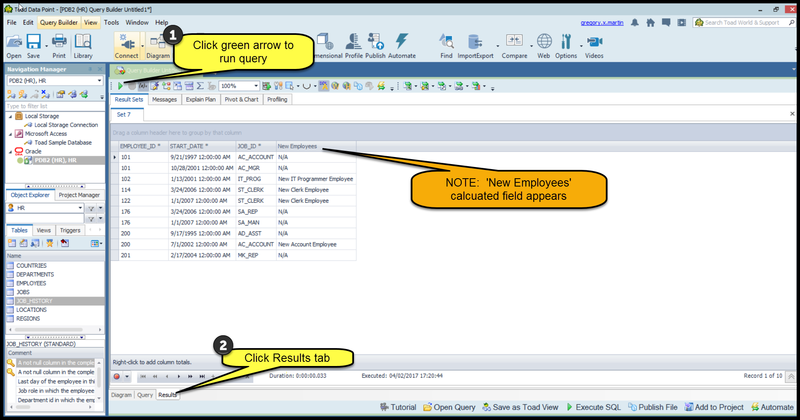 Now for the magic trick, let’s begin by creating a new calculated field using a SQL CASE statement to determine if an employee is a new employee in a particular department. 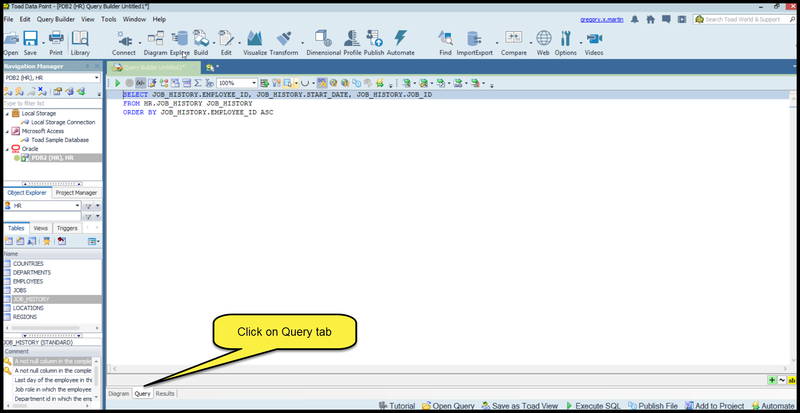 Start by looking at the existing query created above by Toad Data Point in the ‘Query’ tab. 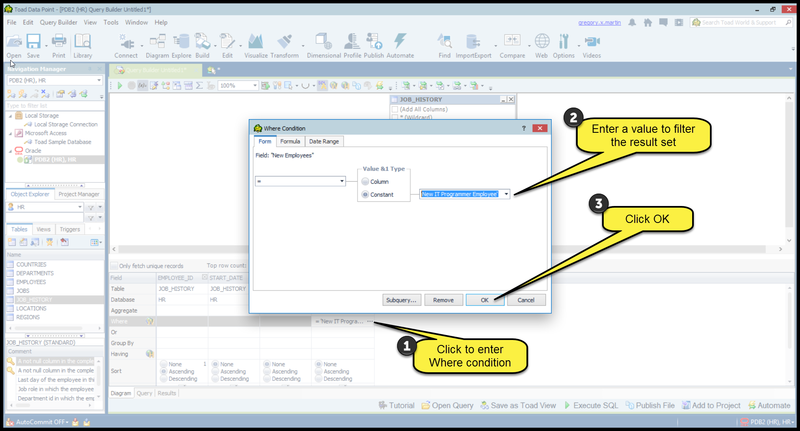 Add a CASE statement to the query in the Query tab as shown below. SQL statement entered is below highlighted in yellow. Let’s analyze by getting down and dirty in the weeds! This means within the JOB_HISTORY table if the START_DATE is greater than ‘03/JAN/2002’ and the JOB_ID equals ‘AC_ACCOUNT’ then we create a value ‘New Account Employee’ for the new ‘New Employees’ field defined in the ‘AS’ part of the CASE statement shown below highlighted in yellow. 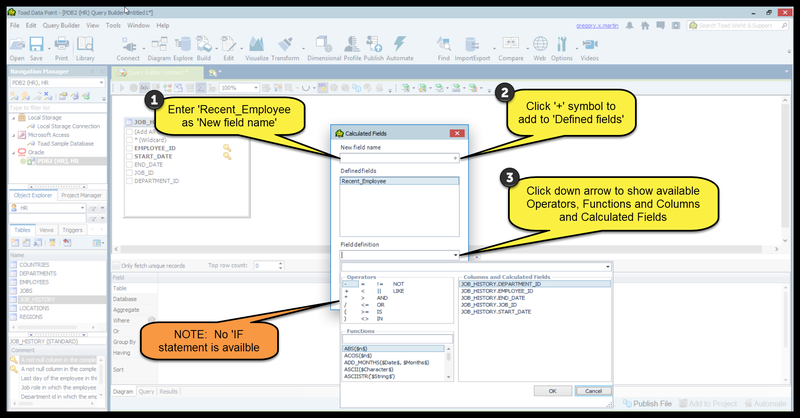 If none of the WHEN conditions are ‘TRUE’, the ELSE condition is executed giving a value ‘N/A’ for the ‘New Employees’ field which will be the name of the calculated field within Toad Data Point. 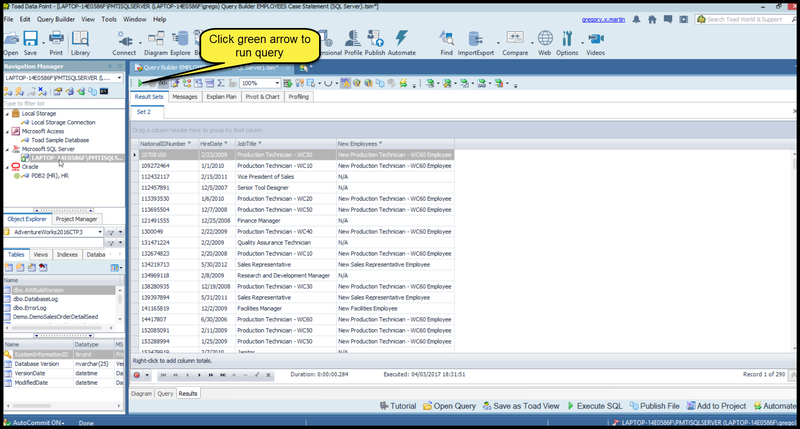 Did you notice the text that says ‘Please press Visualize Query context menu item to synchronize query and diagram after editing.’ in the above screen shot highlighted in green. 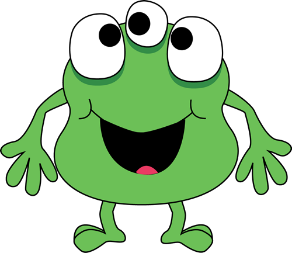 VERY IMPORTANT: You must satisfy the loveable green dude and CLICK the ‘Visualize Query’ button to complete the trick. 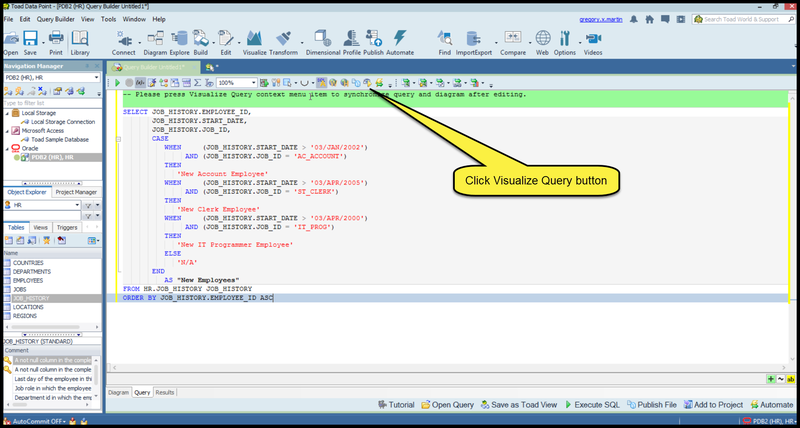 Click the ‘Visualize Query’ button as shown above highlighted in yellow to allow Toad Data Point to create a new diagram based on the modified query with new CASE statement just entered. 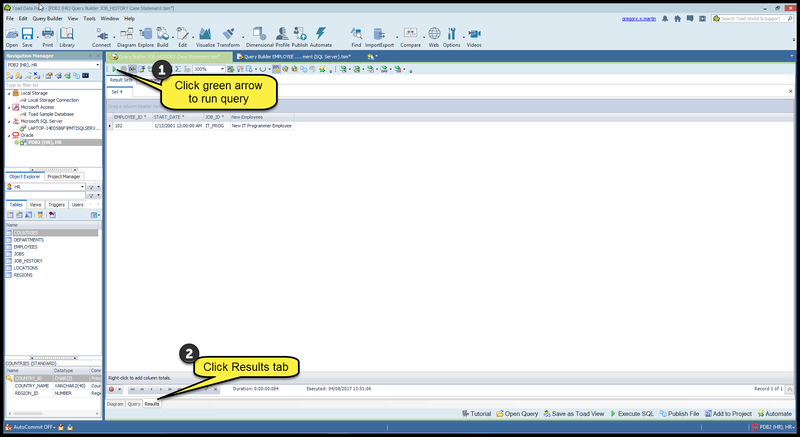 To view the results of clicking the ‘Visualize Query’ button, click the ‘Diagram’ tab as show below. Let’s run the query and look at the results. 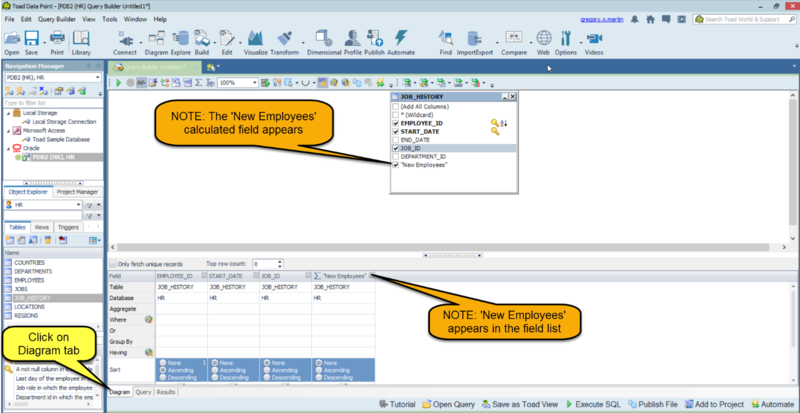 Note the values calculated by the SQL CASE statement in the ‘New Employees’ field. Lastly, check out the definition of the new calculated field ‘New Employees’. 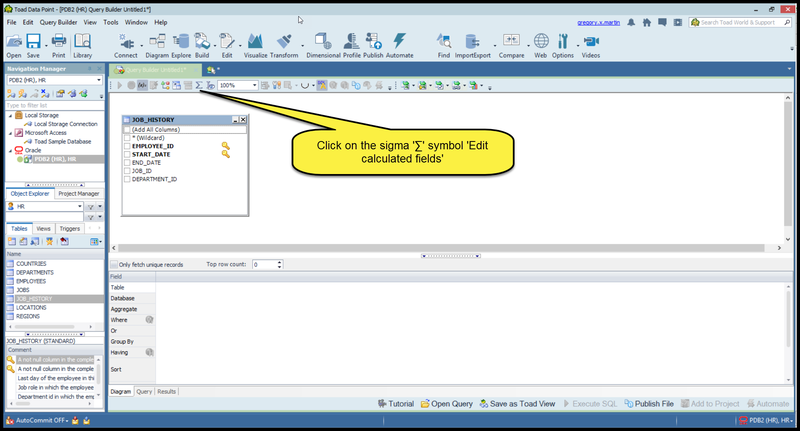 As shown at the beginning, use the sigma symbol ‘∑’, ‘Edited calculated fields’ button to navigate to the ‘New Employees’ calculated field and click the drop down as shown below. Voila! The SQL CASE statement entered into the ‘Query’ tab shows up as a calculated field simulating an IF statement. Why is this IMPORTANT you ask? Typically a data analyst would like to filter on this calculated field. To do this, simply enter a ‘WHERE’ condition as shown below. Next, run the query and view the results. Note: Only the values of ‘New IT Programmer Employee’ shows in the results set. This SQL Server CASE statement example is much like the Oracle example. First create an SQL Server connection similar to the one below. 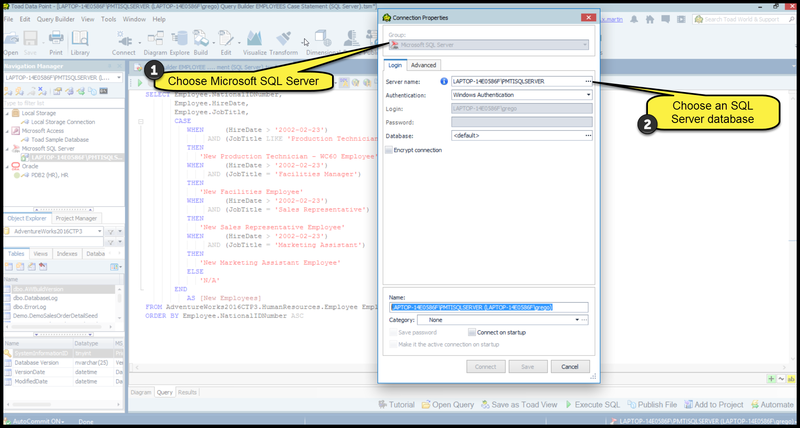 Following the same steps for the Toad Data Point Oracle example above with some minor modification to the CASE statement syntax and given a different table and data, create the SQL Server CASE statement shown below highlighted in yellow. Note the use of the ‘LIKE’ statement in the first WHEN condition. Using the SQL Server 2016 standard example database AdventureWorks2016CTP3. The EMPLOYEES table in this database is too large show the detailed data. But that won’t stop us from viewing the results! Let’s be bold, dashing, daring and ‘Run’ the query. 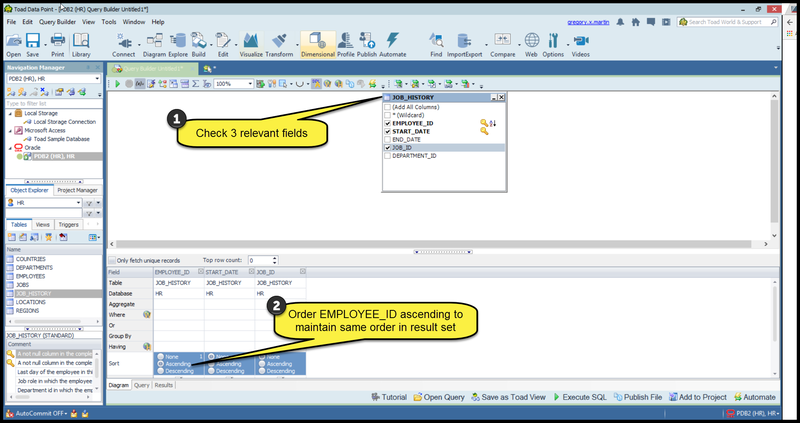 Note the values appearing the ‘New Employees’ calculated field albeit a SQL CASE statement is performing the work. In conclusion, when the need arises for a conditional IF statement within Toad Data Point, use a SQL CASE statement. Many queries can bring back huge results sets and are then filtered with an IF statement. These result sets can be limited by creating a SQL CASE statement and filtering at the database level providing HUGE overall performance query gains by limiting the result set returned by the database engine!